Steamed chicken and lemongrass skewers served with a dresssing of honey, soy sauce, parsley, coriander and sesame seeds. Mix together the egg, milk, salt and pepper. Place the sliced bread in a shallow dish and then pour the egg/milk mixture on top and leave to soak for 5 minutes. Juice the lime. Pick and chop the fresh parsley and coriander leaves. Set the stalks to one side to use later. Place the honey, soy sauce, lime juice and the herbs in a saucepan and bring to a simmer. Allow to infuse and then pass the mixture through a fine sieve. Add the sesame seeds to the mixture. Pass the bread and the chicken through a mincer on a medium setting. Ensure that the mixture is well combined. Heat a wok filled with water to hot and then add the parsley and coriander stalks to the pan. Place a grill tray above the water. 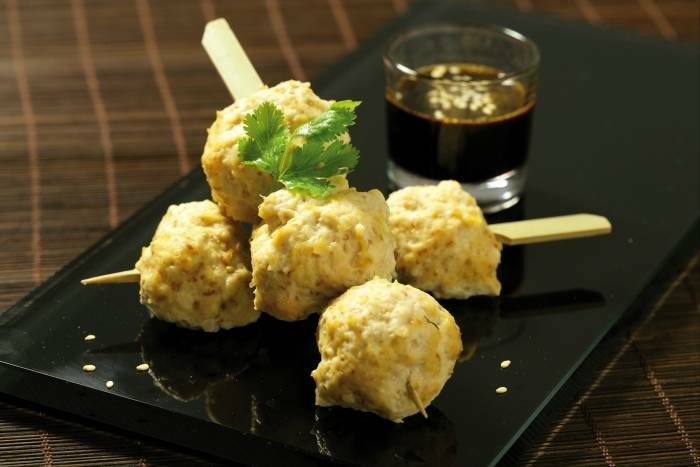 Roll the chicken mixture into balls and thread onto the sticks of lemongrass. Place the skewers on the grill tray, cover the wok with a lid and allow to cook for 7 minutes. Once the chicken skewers are cooked, brush with the soy, sesame and herb vinaigrette to serve.